Have you noticed how many blank pages you can find at the back of your Bible? I don’t know why Bible publishers put them there, but I think we can put them to good use as a place to record milestones and aspects of our journey to maturity. 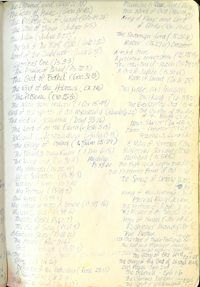 Record the results of a “treasure hunt.” Over several years, as I read through the Bible, I drew a box around every name and title of God I found, and then wrote them in the back of my Bible. What a great way to worship Him now, to just read through His names to tell Him how wonderful and magnificent He is! Record ways in which God reveals His love to us. Every day, God sends what I call “hugs and kisses” to say “Hello precious one, I’m here and I love you.” Most of the time, though, we miss them because we’re not looking for them. When we write down specific incidents that makes us feel loved (or at least aware that He does love us), we have a place to go back and remember the intimacies that show us Father’s heart of compassion. Even the small things, and perhaps especially the small things, will help us learn to pay attention and remember when we forget. For example, on a day when the skies were threatening to open up and I didn’t have an umbrella, I got to my car just in time before the rain started. I mean literally, the second I closed the door, the deluge started. There was no mistaking the love in His timing. I’m so glad I wrote that down, because my mind is a leaky bucket and I forget! 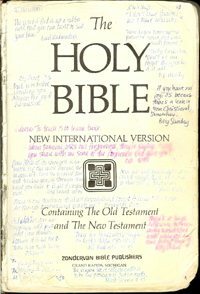 4/79 This Bible itself is an answered prayer. I had been praying for a new NIV when [Dallas radio station] KVIL had a “Take Your Radio to Work” promotion. I sent in four postcards inviting them to visit me at Probe. Sure enough, traffic helicopter reporter Ben Laurie walked in and gave me a $50 bill! Record words of wisdom. I love to write down things that make me think, “Ooh, I want to remember that!” I started with the white spaces in the front of my Bible and when those filled up, I started a separate “wisdom journal.” If my house ever catches fire, that’s one of the things I’m grabbing. What can you use YOUR blank pages for?